Health care professionals working with adolescents with type 1 diabetes will be familiar with this situation and the accompanying sense of frustration. 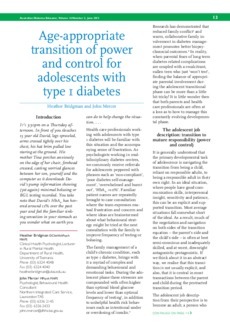 As psychologists working in multidisciplinary diabetes centres, we commonly receive referrals for adolescents peppered with phrases such as ‘non-compliant’, ‘poor diabetes self-management’, ‘overwhelmed and burnt out’, ‘HbA1c >10%’. Familiar patient names are repeatedly brought to case consultation where the team expresses mutual frustration and concern and where ideas are brainstormed about what behavioural strategy might be tried at the next consultation with the family to improve frequency of testing or bolusing.